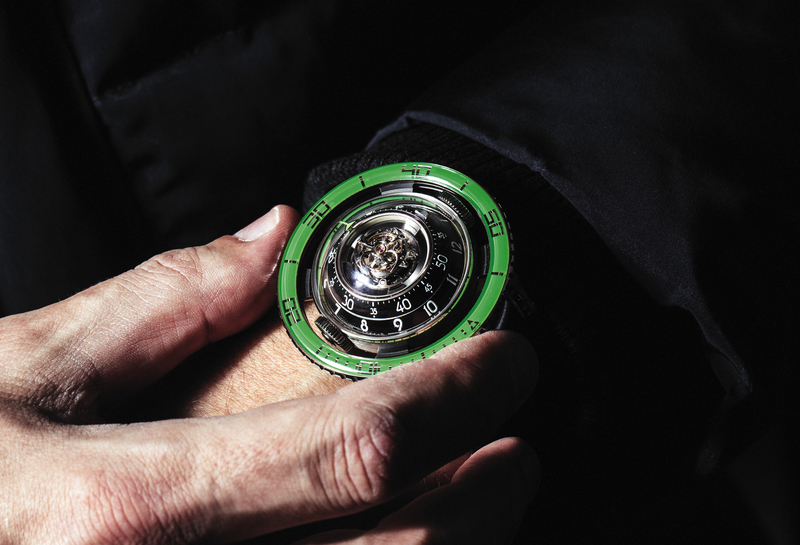 What happens when that master of glorious colour, French high-end watch designer Alain Silberstein, is let loose with MB&F’s Horological Machine No2? The surprising answer is a new, all-black case that epitomises Bauhaus purity and restraint. The new model, called Horological Machine No2.2, is known affectionately in-house as “the black box”. It will be issued in a limited edition of eight watches. 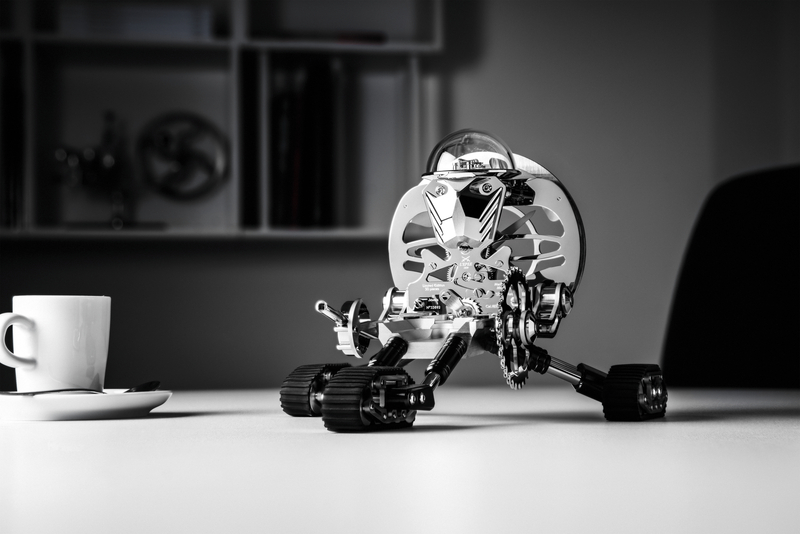 MB&F is a company founded 4 years ago by the former head of Harry Winston Timepieces, Maximilian Büsser, and is dedicated to designing and crafting small series of radical concept watches in collaboration with talented professionals. The new case by Alain Silberstein houses the same groundbreaking “engine” as Horological Machine No2, introduced in 2008 and featuring the world’s first mechanical movement combining an instantaneous jumping hour, concentric retrograde minutes, retrograde date, bi-hemisphere moon phase and automatic winding. What a difference a “.2” makes! Whilst the twin porthole dials are still the focal point – with the jumping hours in an aperture for the first time – the watch’s personality has changed completely. Gone is the science-fiction look of the original. Silberstein says that he wanted Horological Machine No2.2 to combine the pure geometry of the Bauhaus with the user-friendliness of the miniature box cameras of the 1940s. The rectangular case is carved out of a solid block of titanium, resting on the original substructure. This multi-layered construction gives the watch its powerful, richly engineered profile. The simplicity of the case itself is deceptive: Alain Silberstein works with the light, like a diamond-cutter, to achieve a play of mat and polished surfaces when the watch is worn. The titanium case is treated with an exclusive PVD coating incorporating silicium, resulting in a soft touch and particularly intense black colour. The vibrant red numerals, markers and hands are coated in Superluminova for easy night reading. All the characters on the twin displays were designed by Alain Silberstein. Even the moon’s expressive face was inspired by a treasured cartoon from the Art Nouveau period. Inscribed in the side of the case are the words: “Le vrai bonheur est d’avoir sa passion pour métier” (“True happiness is having one’s passion for a profession”). That is Alain Silberstein’s motto, and he found his soul mates in MB&F. He says that the whole point was the pleasure of working together, and Maximilian Büsser agrees. “Alain is a true artist, but he never takes himself too seriously. 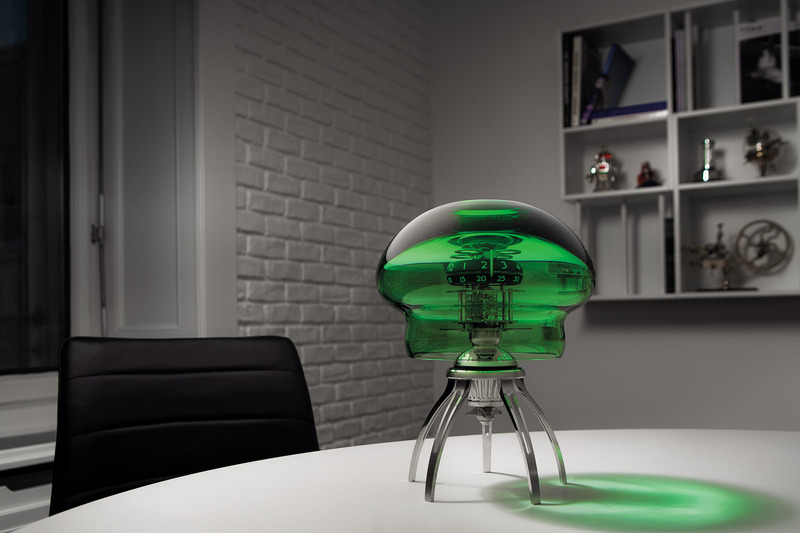 He has kept that childlike spirit of adventure, and that is something that we at MB&F hold dear”.